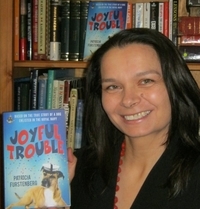 Patricia Furstenberg Author Page Patricia Furstenberg is the author of Amazon Bestseller Joyful Trouble. She writes children stories about real and imaginary dogs and about animals in general. Patricia believes each creature has a story and a voice, if only we stop to listen. To ask Patricia Furstenberg questions, please sign up. And the Oscar goes to… the dog? Stephen Hayes added a status update: My book The Year of the Dragon is in a book cover competition at Cover Wars. Please go there and vote for it if you think the cover is better than the others displayed. You don't have to like the book, just the cover. Competition ends 17 March 2019. Gripping, dark, unputdownable. Loved the humorous scenes. Stuart MacBride is my new favorite author!
" To quote Goethe, "Personality is everything in art and poetry". I applaud this 16 years old writer who dared being different and was brave enough to sh To quote Goethe, "Personality is everything in art and poetry". I applaud this 16 years old writer who dared being different and was brave enough to show it to the entire world by publishing her very first book on an international platform. In my opinion, poetry is open to interpretation as poetry reveals itself in a different light, flavor, emotion to each reader. A book of poems will give us the writer's perspective, offering insight into what he thinks and feels - it is the reader's turn to allow the poem to stir his inner being. And what might rise only question in me today, as a reader, might very well resonate with my emotions tomorrow, as life is a never ending turmoil. Just as a poem will resonate with me in a different way than it will with someone else, I can not expect each poem to strum a chord of my soul today - buy it might very well happen tomorrow. A collection of poems, a book of poems, will always present verses in different subjects, written on different tones as poetry happens in those clear moments when the pen connects the paper with the writer's very core. Poetry is not something produced on the conveyor belt, but... "when an emotion has found its thought and the thought has found words" (Robert Frost). ...more "
Alphonso is a young tortoise price who wants to tackle life on his own, away from the Royal duties. Having left the Palace and his parents behind, he now lives in the Land of Garden, as a pet. He enjoys his new found freedom and, through his kind and Alphonso is a young tortoise price who wants to tackle life on his own, away from the Royal duties. Having left the Palace and his parents behind, he now lives in the Land of Garden, as a pet. He enjoys his new found freedom and, through his kind and friendly nature he soon makes a new friend, the Prickly Visitor. If you thought that a hedgehog and a tortoise don’t have anything in common then you need to read “Alfonso and the Prickly Visitor” – Susan Moffat does a wonderful job at teaching children that new friends are always within easy reach and kindness does goes a long way. I thoroughly enjoyed the bright, cheerful illustrations and the different emotions depicted in them. They certainly help getting the reader hooked and enhance the story-line. Loretta Brennan is widowed and mom to 11 years old Tessa, interested in computers. To make meets end, Loretta decides to take on a risky job for the National Carriers, using her truck she has to transport a load or oranges from Oklahoma to Cheyenne, W Loretta Brennan is widowed and mom to 11 years old Tessa, interested in computers. To make meets end, Loretta decides to take on a risky job for the National Carriers, using her truck she has to transport a load or oranges from Oklahoma to Cheyenne, Wyoming. It is winter and the weather forecast predicts heavy snow and winds and Loretta has to drive alone as she was left without a partner when her husband passed away, a few years ago. But she is determined to make it to Cheyenne on time so that she will receive the bonus which will save her from her financial situation she is in. Problems arise on the road and she is forced by dangerous circumstances to take a driving partner, Sam Emerson. Was this the right decision or will she regret it as they get involved in a series of murders along the way. Could Sam be involved and will Loretta ever see her daughter again? I have thoroughly enjoyed “Manipulated Lives” by H.A. Leuschel so when her new book, “My Sweet Friend”, came out I was excited to be able to read it. Leuschel has a wonderful way with words, her story flows and, before you now it, you’re hooked. The st I have thoroughly enjoyed “Manipulated Lives” by H.A. Leuschel so when her new book, “My Sweet Friend”, came out I was excited to be able to read it. The story is told from two points of view, that of the victim and of the manipulator, moving seamlessly between past and present, yet the distinction is very clearly made and each chapter brings another piece into the puzzle. Leuschel did a wonderful job here as up until half way through I was not sure which one of the two was the victim and which the manipulator. Afterwards I still hoped I might be wrong in my assumptions as both main characters were likable and, although despising him, I felt sorry for the exploiter. This is a contemporary story, yet not at all overpowered by the presence of social media. You will find the modern office drama and lifestyle (this part reminded me of “Neanderthal Seeks Human” by Penny Reid) as well as the holiday scenery of Biarritz.
" Thank you so much, Nada! It is a beautiful review. So happy you enjoyed Puppy. This was long before docking and cropping became banned in Europe. Today, even without a federal law in place, most Veterinary’s throughout the world oppose these cosmetic practices. But what Tara lacked in tail length she made up for in rear muscle strength! When she was happy, she was HAPPY, wagging her short tail, her rear-ends and sometimes even her back! Before Tara we sheltered a lost Blue Great Dane puppy, Honda, for a few weeks. Honda was a tall puppy, I thought… aged two, as her owners mentioned when they fetched her. 24 hours after we’d found her, our average-size apartment was already “tail-proofed”. Because Honda didn’t just have a tail, she had a secret weapon. Luckily for us it was winter, no explanations needed as to why our legs were bruised. You don’t have to be a canine specialist to know that dogs have a way of changing how we think and behave. When children’s author, Patricia Furstenberg, adopted her first house-dog she found her behavior changing and she was soon to learn the meaning of unconditional love. When I selected Tara, my first house-dog and a German Short-haired Pointer, she looked like a seal. You know, the luscious, dark furred, round-bottomed sea-creature with gleaming eyes and long whiskers. I was not round-bottomed nor did I have whiskers 25 years ago. But Tara did and she also had honey-colored eyes and long ears, framing her face like well-set curls. Have you noticed how much a dog can communicate by just looking at you? How they’re able to turn every situation in their favor? Or by lifting them, curving them over her eyes, suddenly so big and innocent, this movement often combined with a small drop of drool in the corner of her mouth. “I trust you unconditionally to take care of my every need,” they’d say. She was always giving and loving, unknowingly fueling my love for animals; teaching me that unconditional love has no limits.